Zucchini and summer squash are easy vegetables to grow in a backyard garden and are often in excess at farmers markets in the summer. If you have an abundance of zucchini or summer squash and have the freezer space, you might want to freeze the surplus. It's very easy and will allow you to enjoy farm fresh zucchini or squash all year long. If you have a lot of vegetables, you can freeze it in a variety of cuts, depending on how you think you'll use it. Freeze the squash cubed or sliced if you plan on preparing the zucchini or squash as a side vegetable, casserole, soup, or stews. You can also grate it and freeze it in 1- to 2-cup portions for zucchini bread, muffins, and cakes. Feel free to combine zucchini and summer squash when you freeze them. The taste is very similar and since much of the difference lies in the outside skin color, the combination of the two will not be very different. If you truly prefer one over the other, freeze them separately and label them before putting the vegetables into the freezer. Wash the squash and cut off the blossom and stem ends. There's no need to peel the squash. Slice or cube the squash. Fill a large bowl or container with ice and water. Fill a large stockpot or kettle with 1 gallon of water; bring it to a boil over high heat. Put about 1 pound of the prepared squash in the boiling water. If you have a wire basket, you can put that in the water and then place the vegetables in the basket. Using a wire basket in the water will make it easier to lift all of the squash out at the same time, but it's not necessary. Once the water has returned to a rolling boil, begin timing. Immediately immerse the blanched squash in the ice water to stop the cooking. Drain the squash thoroughly and then transfer to freezer containers, leaving 1/2-inch of headspace (leave at least an inch if using narrow-mouth glass jars). If freezing in zip-close storage bags or if you're using a vacuum sealing system, first freeze slices or cubes on a large baking sheet in a single layer. Seal the vegetables in bags using a vacuum sealing system or by removing as much air as possible from a freezer bag before sealing. Label the containers or bags with the name of the vegetable, the cut, and date. Once sealed and frozen, it can be stored for up to 3 months, or up to a year or more if vacuum sealed. Note that 1 to 1 1/4 pounds of zucchini or summer squash will yield about 1 pint of frozen vegetables. To cook, place about 1/2-inch of water in a saucepan and bring to a full boil. Add a pint of frozen vegetables, cover the pan, and cook until just tender. Defrost grated zucchini before using it in a recipe. Blot away excess moisture with paper towels before adding to the batter for cake, bread, muffins, etc. 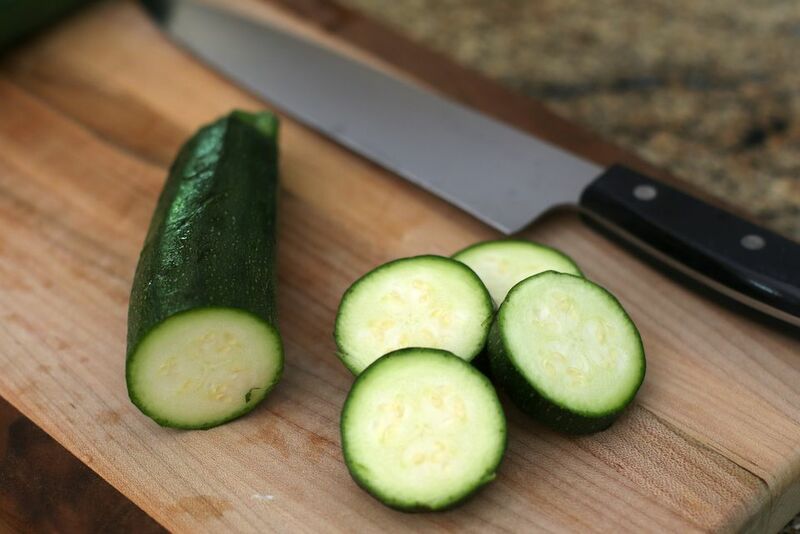 Note that the texture and color may change from the deep freeze, so defrosted zucchini or summer squash will not look or taste the same if eaten raw.